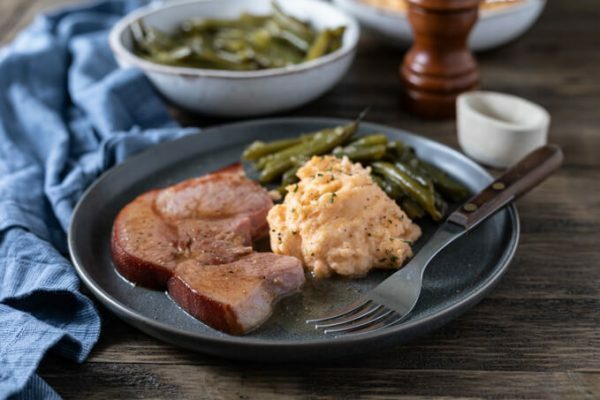 Ham steak with red-eye gravy is an easy comfort food classic that takes mere minutes to make. The slightly bitter coffee gravy a great accompaniment to the rich salty-sweet taste of ham. This is a tasty comfort food dish my mother taught me after I graduated college and was living on my own. Southerners will rightly take credit for this dish, but my grandmother learned how to make it as a young woman working in a diner in upstate NY. A ham steak is a thick slice of ham including a small circular bone near the center of the steak. It’s about half an inch thick and varies in size, but will easily feed four people with sides. 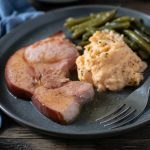 The beauty of a ham steak is that it cooks in about 6-7 minutes, so it’s a fantastic meal to have in mind for a busy week. Red eye gravy is a great foil for the ham. Mom always made – gravy with strong coffee and bacon grease. The slightly acidic bitterness of coffee marries nicely with the rich salty-sweet taste of the ham. It’s a match made in heaven. But, make sure not to burn the coffee or it will be too bitter. 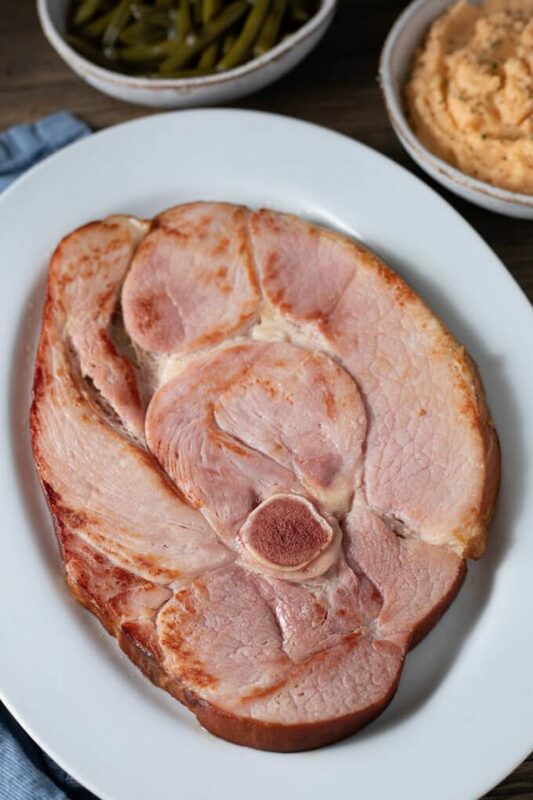 The easiest way to cook a ham steak is in a frying pan on the stove. Let the ham come to room temperature for 20 minutes. Then heat up the pan, add some oil (I like bacon grease) and brown the ham 3-4 minutes per side depending on the thickness of the ham. That’s it! Serve immediately or cover loosely with foil if you want to make red eye gravy. 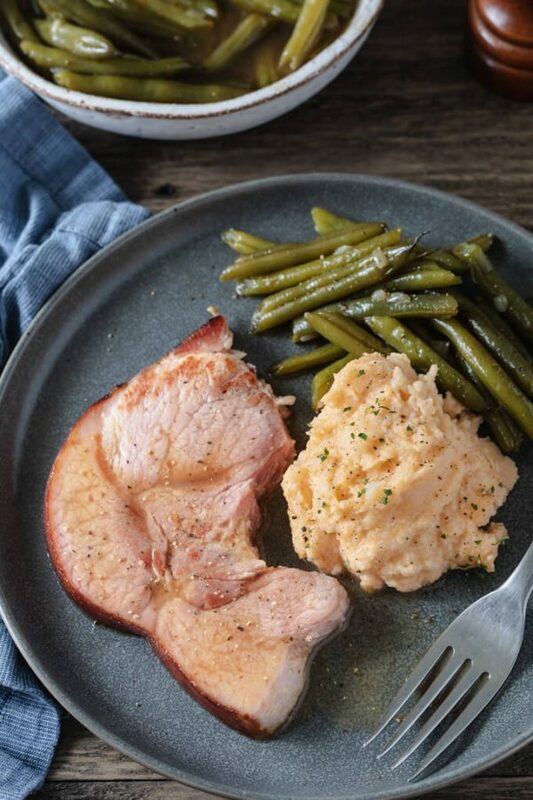 You can also use a small pre-formed boneless ham to make this dish. Just slice the ham into 1/2 inch slices and brown both sides in the pan. You can get three slices in the pan at the same time. Making red-eye gravy is very easy. After browning and removing the ham from the pan, turn the heat down to medium and add 1/4 cup of strong coffee and 1/4 cup of water. Stir to scrape up any browned bits of ham from the pan. Then, add two tablespoons butter and 1 tablespoon ketchup, stirring to blend the ingredients. Red eye gravy is a thin, but flavorful gravy. It can become quite bitter if cooked too long or if the pan is too hot. Adding a little butter helps temper the bitterness and the ketchup helps balance the overall flavors. Some people add a touch of brown sugar, molasses, sorghum syrup or maple syrup instead. Grits or mashed potatoes are traditionally served with ham and red eye gravy, but so are biscuits and/or french bread. Since I follow a low carb diet, I serve cauliflower mash or roasted rutabaga instead of a starch. 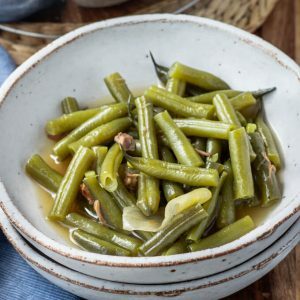 Green beans, especially Southern Style Green Beans are also traditional, but collard greens, Brussels sprouts, or any sautéed greens are equally good. Although I serve ham steak with red eye gravy for dinner, it’s just as appropriate to serve it for Sunday breakfast with biscuits, eggs, grits, and sorghum butter. Low Carb or Keto dieters should try it with eggs and low carb pancakes or waffles. Maple walnut scones would also be tasty! 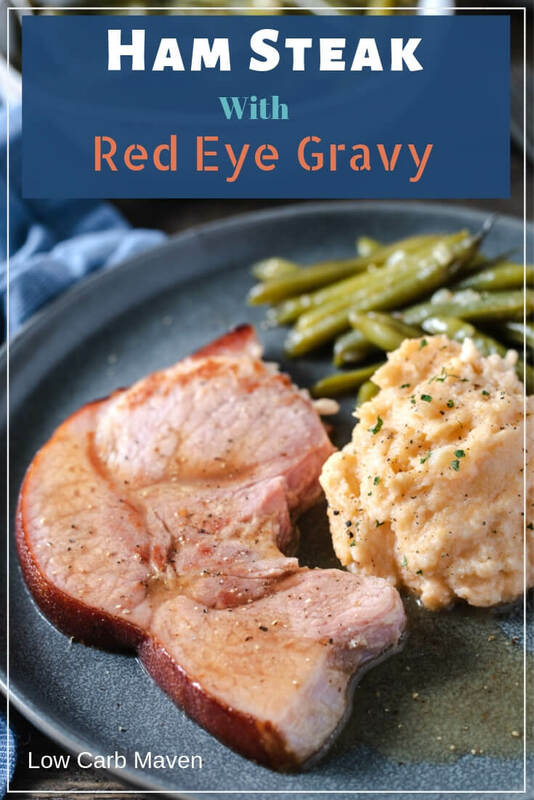 Ham steak with red eye gravy is an easy comfort food classic that takes mere minutes to make. The slightly bitter coffee gravy a great accompaniment to the rich salty-sweet taste of ham. Let ham steak come to temperature for 20 minutes. Blot it with a dry paper towel so it browns and doesn't steam in the pan. Place a large frying pan over medium heat. When completely hot, add 2 teaspoons of oil and tilt pan to distribute the oil. Put the ham in the pan and cook for 2-3 minutes per side until browned and warmed through. Remove to a plate and keep warm. Turn the heat down to med-low and add the coffee and water, stirring with a wooden spoon to scrape up any brown bits. Let it reduce slightly, then add the butter and ketchup (see post for other ideas). Stir until the butter melts and is slightly emulsified in the gravy. Spoon over the ham at service. Serves 4. What a great idea! I’m always at a loss for ways to dress up ham. My husband and I had this for lunch today, with roasted garlic smashed cauliflower and spinach with butter and vinegar. It was a hearty Southern-ish lunch. I should have reduced the gravy a bit more, but I was worried about burning the coffee. I did add a pinch of salt, another tablespoon of ketchup, a smidgen of molasses, and a few drops of Worcestershire sauce. I think the additions rounded out the flavor nicely and offset the bitterness of the coffee.. Next time I’ll reduce the gravy more, and I’m sure the more intense flavor will be excellent. We’ll definitely have it again. Thank you, Kim!